Taken on 11/10/07 exactly one year to the day after my first traditional harvest! 7:30 a.m. The arrow hit farther back than I liked, but the quartering away angle helped. Complete pass through. She ran 150 yards. 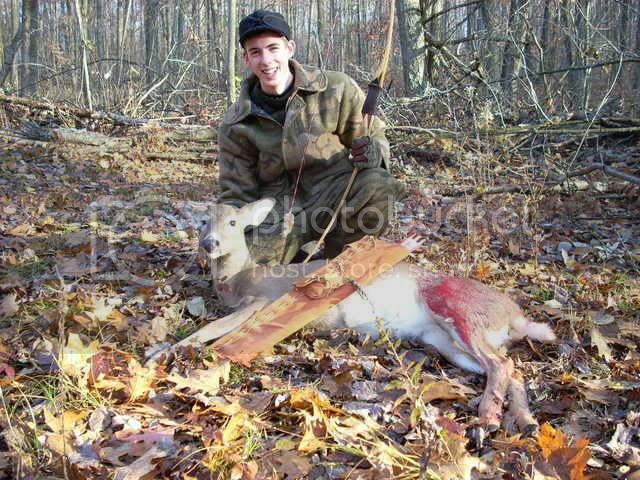 Nice job....with trad gear, it's never just a doe! way to go! 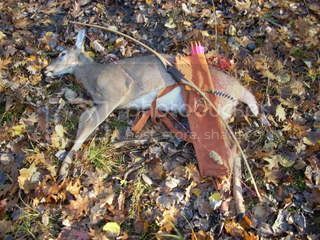 Every trad harvest is a trophy. Thanks everyone! I do what I can! CONGRATULATIONS! NO ANIMAL IS EVER "JUST". From one lefty to another, way to go dude! Nice job, your on a role now! I agree...there is never just a doe. Doe's rock!